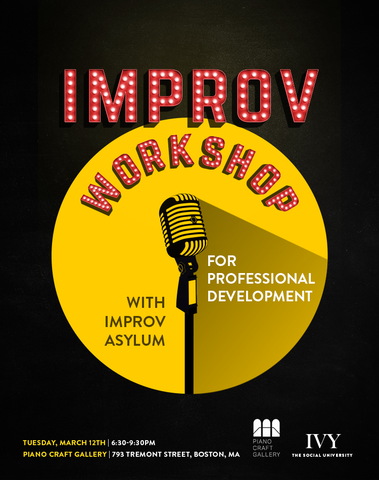 The Piano Craft Gallery is excited to host IVY: The Social University for an Improv Workshop for Professional Development with Improv Asylum. "We believe everyone has limitless potential. Our mission is to trigger transformative ideas and collaborations that lead to unprecedented human unity, progress, and fulfillment. Through meaningful experiences with inspiring individuals, IVY provides a lifelong supply of new friendships, opportunities, and ideas."